Prior to joining Talquin, Sean served for five years as the Manager of Finance at Tri-County Electric Cooperative, a 12,000 Member cooperative headquartered in Madison, Florida. 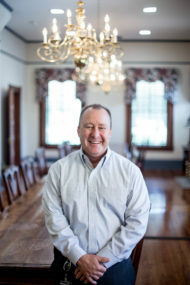 Sean holds a Bachelor of Science Degree in Finance and Accounting from Florida State University and has an extensive background in governmental accounting before moving to utility accounting. In his spare time, Sean enjoys fishing, playing golf and spending time with his wife, Michelle and their two daughters.